In last few days we have posted series of Spot the Difference puzzles. In most of these Odd One Out Brain Teasers three pictures are given. Two of these pictures are same but only one picture is Odd One Out because there is very small difference in this picture as compared to other two pictures which are exactly same. So you have to find this difference and spot the different picture in these three given pictures. Spot the Difference is very interesting Brain Teaser. Kids loves to solve these kind of brain teasers. In these Brain Teasers, three pictures of same object are given. Out of these three pictures two are exactly same and third one is slightly different from other two. Aim of these brain teasers is to find that picture which is different from other two pictures. 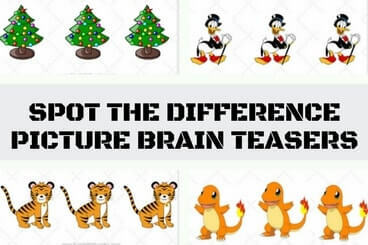 Here there are six such odd one out brain teasers in which one has to find which picture is different from others two. Answers link of each of these pictures is put at the end of the post. Do try not to look at the answers and try to solve yourself all these spot the difference and find odd one out puzzles. Do watch the answers only to confirm your solution for these puzzles. 1. Spot the Same Pictures: This is the Picture Puzzle in which four pictures are given. Two of the pictures are exactly alike while other are different. You challenge is to find these two matching pictures. 2. Can you find Odd Letter Out? : It contains Very Interesting Picture Puzzles in which a set of Letters is given. Your challenge is to find out letter which does not belong to the group of letters. 3. Stroop Effect-Can you pass this color test? : Can you recognize the colors? If yes, give this Stroop test in which your challenge is to say aloud the color of the given words. 4. Cut the Cross Puzzle for Kids with Answers: Here is very interesting Picture Puzzles for kids in which task is to cut the given shape in four different congruent parts. Can you solve this simple picture puzzle? Here is answer to 10th Brain Teaser Question of post titled "Simple Math Riddles for Teens and Kids with Answers to Twist your Brain". Answer is 1610. If A+B = D then D = (AxB)(A+B) i.e. (2x8)(2+8) = 1610.